After years of exposés about the horrors of factory farming, many people want to believe that, as long as they buy "local", "organic", "family farmed", "free-range" animal products, they are making a "humane" choice. 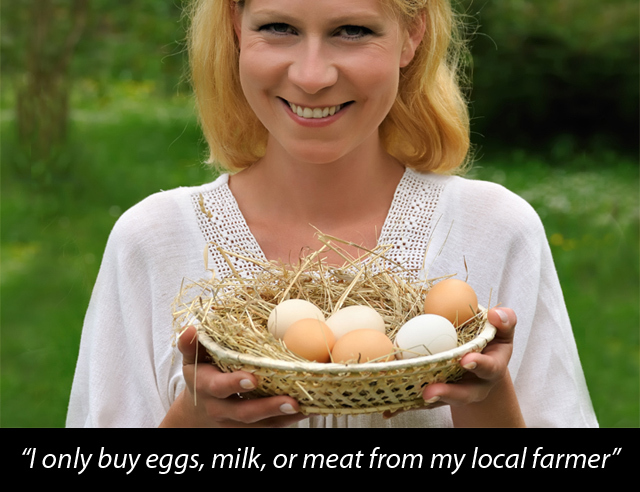 These days, we hear all too often, "Well, not all farms are like that", or, "I only buy eggs, milk, or meat from my local farmer where the animals are happy and well cared for". Nothing could be further from the truth. In reality, no matter how "humane" the farm may appear through human eyes, it remains a death camp for the animals who are bought, sold, kept, bred, used, and violently killed there. Those of us who rescue, provide sanctuary to, and advocate for the animals who are freed from the very farms that the public wants to believe are "humane", know first hand how destructive the "humane" farming deception, and self-deception, can be. As you read and view The Humane Animal Farming Myth, please understand that the cruelties and injustices discussed in its pages are inherent in ALL egg, dairy and flesh production. • All male chicks are killed in the course of egg production, whether at the hatchery or on the farm, because they do not lay eggs. • All females used for eggs, milk, or breeding are killed at a fraction of their natural lifespan when their "productivity" declines. • All females used for eggs, milk or breeding have their reproductive systems violated, manipulated and exploited. • All animals exploited for eggs, milk or flesh have been genetically manipulated to increase their "productivity". • All animals raised for flesh are barely adolescent when they are violently killed. • All animals used for human purposes are denied a natural life. No matter how friendly the farmer is, or how bucolic the farm may appear, to the animals whose lives are manipulated and destroyed there, there is no such thing as "humane" farming.